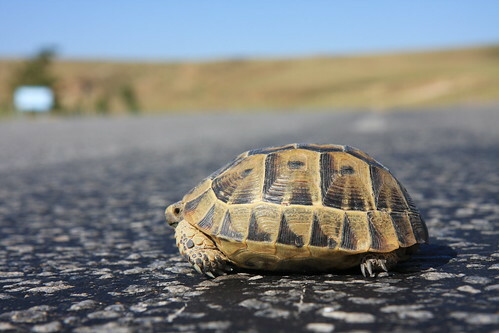 It was a slow start into the day that was supposed to lead me to Iran … it did, no worries. I just knew that I wouldn’t have to cover a great distance as I was wanting to watch the football match between Germany and Turkey on the other side of the border with Iran - hence the goal for the day was the city of Maku and a hotel that had a TV. As I was heading past Mt. Ararat to my left the wind was fiercely blowing into my face. Regardless of the way the valley turned, the wind was coming straight from the front. Seemed like it didn’t want me to go to Iran. Once I got to the border I was surrounded by people who wanted to exchange money. Not knowing what a good exchange rate was I wasn’t going to go for it. It was a good thing as the price there would have been 30% less than later on in Iran. And what I don’t understand is how people are allowed to hassle you in the cordoned off area on the Turkish side. 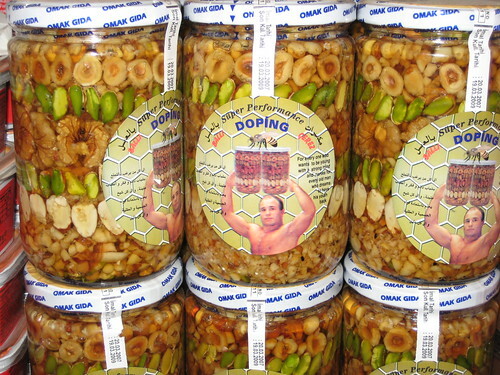 Nothing like it on the Iranian side. Then things became interesting. I was practically through the Turkish control when I was held up. The bike seemed to cause an issue. Understand that I was about 5m (15ft) away from the border gate between the countries. It was literally within reach. The official told me that I was missing a plaque on my bike. 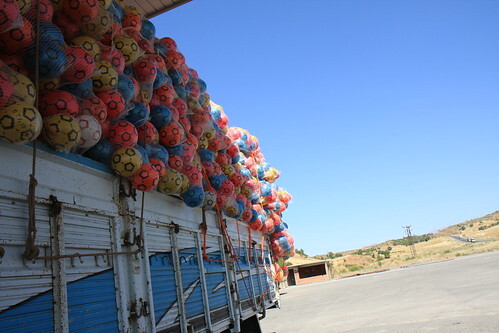 This is at the end of the trip through Turkey. I tried to tell him as much. I am LEAVING the country and not entering. He wasn’t going to have any of it. I was sure that there was no requirement for a plaque and I certainly wasn’t going to get one here. Turns out that he was wrong and that it was a requirement for motorcycles and not for bicycles. I had told him as much, but he was chastised by this superior in the end for holding me up for 30 minutes. Strange feeling it was as I was leaving Turkey and going into a country that I didn’t really have much of an idea about. I always get a bit of a strange feeling entering a new country - one of anxiety and nervousness. But that is part of the fun I suppose. Then, stepped over the line … and was in Iran. I was greeted by enormous placards depicting Khomeini and very courteously by an Iranian border guard and led into the control area. Looked like an airport terminal. Nice, sleek and modern. I had made sure that all the files were backed up and on a separate hard drive before entering. I shouldn’t have worried. Things were typed into a computer and then scrawled on a piece of paper, I was asked where I intended to leave the country - and that was that. Smiles from the border guards as they saw the bike and all of a sudden a person from the tourist organization - answering all sorts of questions and friendly as well. I was off after a bit of money changing and couldn’t help the gloat on my face as I was rolling down the hill into a new country. 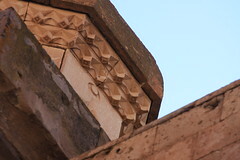 I was in Iran. Not that it looked much different. Mt. 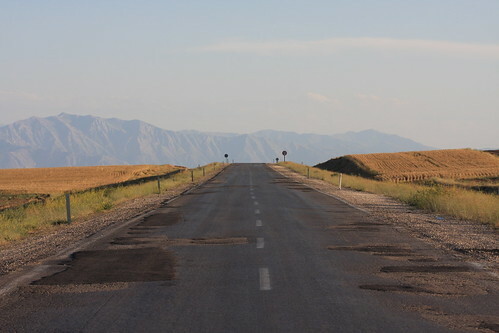 Ararat was still there and the road was the same as on the other side. Sure, women wear head scarves and it takes a bit to get used to it when you see it everywhere. 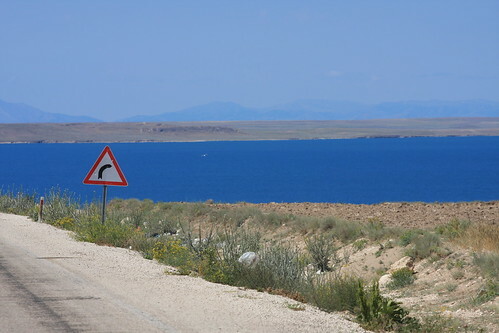 And the driving is just as mad as it is in Eastern Turkey, but no real surprises there. 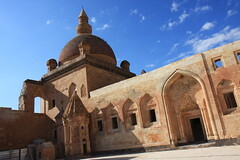 The mosques also have a different look. 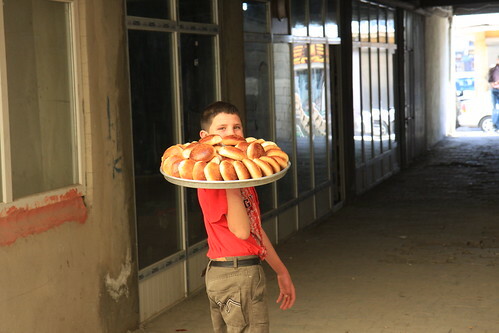 Then I rolled into Bazargan, the border town intending to change some money. That proved to be more difficult than I thought. I went to Melli Bank Iran (the National Bank of Iran), figuring that it would be a natural place to go. It wasn’t. I enter and no one pays attention to the foreigner. After a while I say something about exchanging money. The three people behind the counter stare at me like a ghost. And all of a sudden get into high gear. Things are moving fast. One guy discusses things with another, throws him his car keys. I understand nothing of course. Then in very broken English I am told that I should put the bike in the bank. What??? Yes, bike in the bank. This is Melli 4. We don’t exchange money. Melli 1, Melli 2 and Melli 3 do. But not Melli 4. So we drive off to a money exchange place and I get to change some Turkish Lira into Iranian Rial. Good stuff, thanks so much for taking care of this Mustafa. 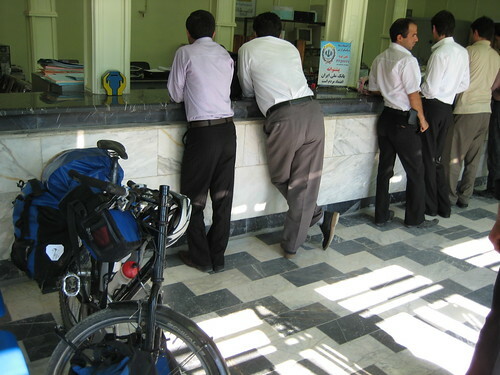 All the while, an Iranian soldier is standing next to my bike in the bank with his gun ready. I guess it is worth defending.Then I cover the next few km into Maku, which is located in a canyon - but not really attractive. I am shown to a couple of hotels by someone I meet on the street and book into a small and somewhat shabby room. 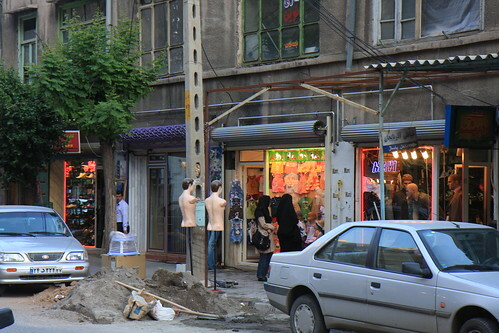 It was cheap and the old adage holds true in Iran as well: you get what you pay for. Except in Maku you didn’t have much choice. I stroll through town, trying to get my handle on things in a new country, new money, new rules, new customs and that sort of thing. Female attire is of course different here, but you can see there is a rebellious streak in a lot of women as they defy the strict rules by wearing jeans, makeup and letting the head scarf slip back just so much more than would be “appropriate”. Waking up early can be a real treat. Everything is still quiet and you can enjoy the surroundings. Such was the case. 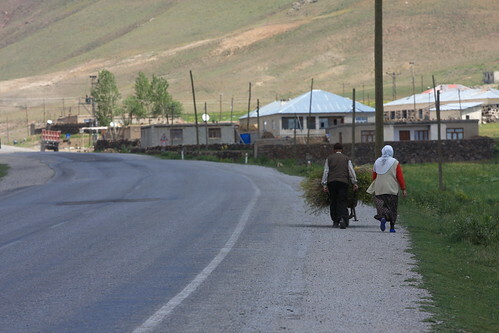 I had a melon that I ate for breakfast with some other goodies and set out to head towards Dogubayazit. 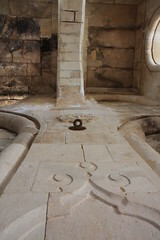 It was described to me by one reader as the most dangerous part of the journey through Turkey. I wouldn’t subscribe to that view, but the day was eventful to say the least. After a brief stop in Caldiran, the climb continued - first almost entirely flat only to become successively steeper towards the end. This was also serious military land. There were more military vehicles on the road, tons of guard towers on my right (the border with Iran is only a few km away) and a checkpoint. 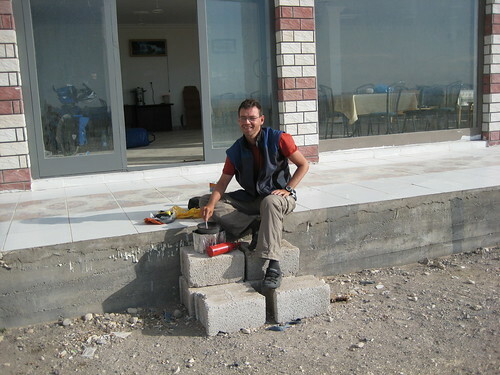 Once I got past the guy that only wanted to chat me up out of boredom (they were building a guard house and had nothing to do with the actual check point) and because he could speak English (where are you going, why are you going, you are not going to Azerbaijan) and me trying to be polite but I eventually told him that I’d be happy to answer any question at the actual checkpoint 50m up. Once I got there I was barraged with questions in Turkish - I handed over my passport (apparently not fast enough as I got yelled at) and tried to answer as many as I could. After a bit more yelling (Markus, remain stoic) I was let go and moved further up the pass. The higher I got the more desolate the villages became. This is the top of the pass … (I know this is nothing compared to Central Asia in terms of hight) after eating a bit something and enjoying the view I headed down again. This is where things went sour for me. Just after taking this picture I happened upon a goat herd with five or six herders. I was stopped because the animals were crossing the road. No problem. Then the second guy asks me for a cigarette (the oldest person, about 50-60 year old), I say I don’t have one. Then a kid basically yells in my face and I roll past him figuring that things are alright. I hear something behind me, turn around and see a herder’s stick flying towards me - the kid having thrown it. I bring the bike to a halt (don’t want the stick to fly in the spokes) and pick it up. I was ready to break it - I should say I was a bit fuming at this point, maybe understandably - when I see three young guys moving towards me. I just throw the stick away and roll down. I was disappointed and angry and didn’t understand what the ! @#$ had happened. Just as I snapped this one I got badgered by two more young guys throwing stones at me after I didn’t give them any cigarettes (they were like 8 years old). An elderly woman just looked on and when I told her that this is ! @#$ she was rather non-plussed. Can’t get my head around this stuff. Are they getting off on this kind of stuff? Sure enough, a few km down the hill - after many more smiling and waving kids - a girl waves at me only to have her younger brother spit at me. That was about all I needed. Of course you can’t figure out why they would do this. I am simply biking along and the owner of the hostel was just as much out of his depth. He said that they were - for some reason - extremely aggressive in these villages. But so many kids weren’t so openly hostile. It was just strange. More One Love goodness made things better again after more wind struggles I finally got to Dogubayazit. The castle above the town is magnificent and having Mt. Ararat on the other side is a great feature. I hitched a ride to the castle filled with banter about the upcoming Turkey - Germany football game. There are lots more pictures on the flickr site. Strange thing - though not unexpected: as I am heading to a different country again, I am warned that people are strange and can not be trusted. I heard that so many times before. I am not inclined to believe it this time either and must say that I am intensely curious about what lies ahead. After the midnight talk was done I could sleep finally and did so until about 6am. Packed up, had some breakfast and set out. The wind was still there - sometimes pushing me, but most of the time coming from the front. Seems to be the prevailing story of the day. The lake on my right, I moved on to Erçiş where I wanted to take care of some logistics and experienced my second blackout in a few days as I was organizing the next visa issues online. The power just went out. There’ll be another day to take care of that. Once out of Erçiş the wind was more serious. It was interesting. It came out of completely different directions. There was no predicting what would happen when you crested another set of little hills. It was mostly in your face of course. 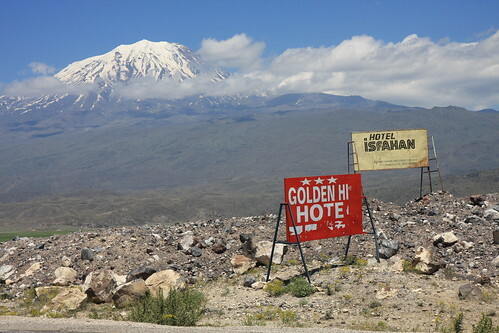 I was pretty tired by the time I got to the turnoff towards Dogubayazit and thought about just throwing myself down someplace and stay there for the night. The wind was coming right at me with a force that seemed impossible to bike into. I stopped at a gas station. Became bored. I looked up at the sky and saw clouds moving to the North, while the flag only 25m away clearly went the other way. Moved on and lo and behold was able to round a corner where the wind abated a bit. 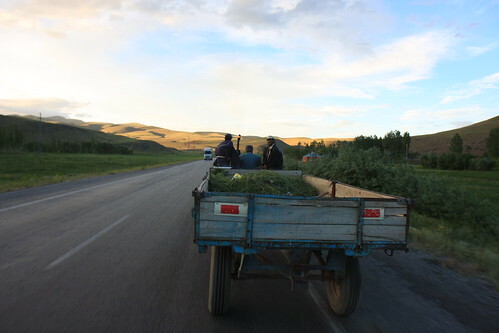 I kept moving for another 30km ultimately - making a stop in Muradiye. On the way further up the valley I only thought about covering distance and gaining altitude. Every one of those I wouldn’t have to cover tomorrow when I am heading towards the pass. This tractor was a major help along the way. Quite tired, it provided some good draft up the hill and motivated me to go faster than I could have done without. This is now serious Turkey hinterland. 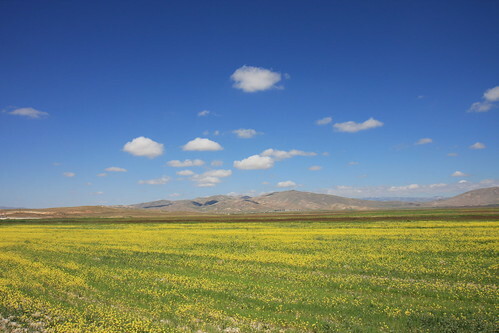 The Iranian border is only a few km to the East and the villages are getting poorer and poorer. 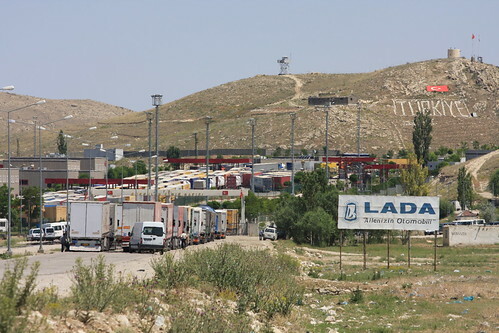 I camped outside of Gümüştepe after asking a farmer whether it was OK to do so. A quick tour around town showed a rather sad state of the housing and general living conditions. One general observation since I got a number of questions about this. Yes, whenever I mention that I am from Germany the question invariably turns to the football match between Turkey and German this Wednesday. The rare times I watch TV (or have the chance), news are full with reports about the event. People keep asking me what I think the result will be - I raise my eyes and just say insha’Allah after a bit of back and forth. 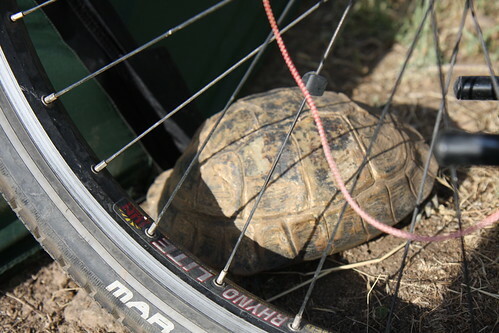 The turtle was snuggled up between the bike and the tent and I suspect that it moved around a bit during the night and woke me up as my head was right next to it. I had decided to take it easy after two hard days of biking and so I bumbled along the lake at a very leisurely pace and took my time. 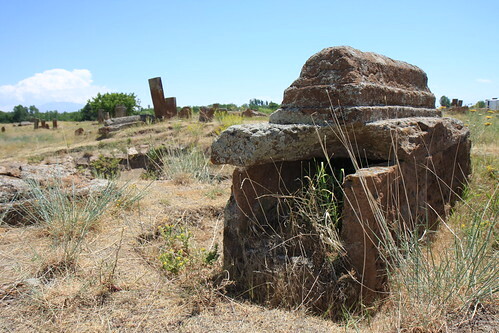 In Ahlat I went to a huge cemetery, which was quite impressive (though it did lack any of the ravens sitting on the gravestones as my guidebook had indicated - it was still impressive). 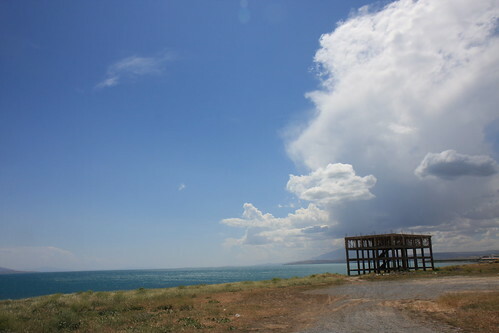 Over lunch in Ahlat the weather changed dramatically. There were dark clouds all over, the wind had picked up immensely and was coming in from the side. I decided to put off my departure a bit and though not great, it got better after a while. Sometimes pushing, most of the time a force coming in from my left hand side the wind was playing its game. 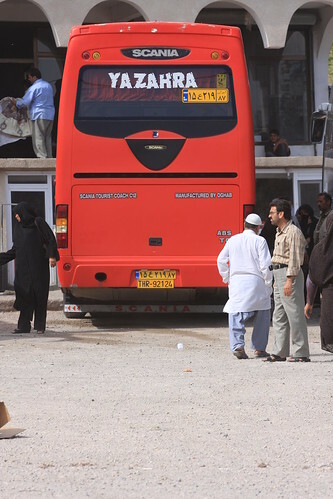 As over the last couple of days, I saw a lot of buses from Iran - a number of bus stops specifically catering to them (signs are a giveaway, not that I understand any of the writing). Towards the end of the day the wind was with me until I hit a little hill and from there on it was fully in my face. There was no chance to pitch a tent in that kind of wind I thought and there were no trees or bushes to hide behind. The area was amazing, but camping was out of the question. I stopped at a gas station hoping for the wind to lessen. No chance. The owner offered his place which I gladly accepted. I ended up in the guestroom - only to be woken up during the night by him and two other people talking loudly and drinking tea. Not sure what the deal was - they eventually moved after seeing me bleary-eyed and not too happy. I was grateful, but if you offer this, then give me a chance to rest. Talking loudly at 2 am (whispering wasn’t an option) wasn’t my idea of having fun. Still, the day was great and I am enjoying the views. 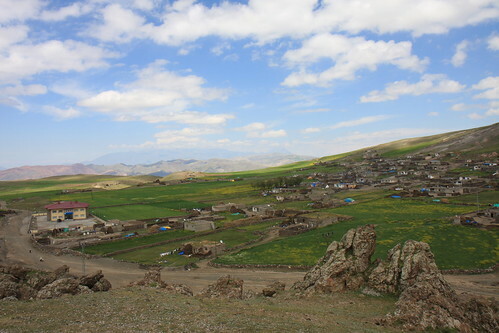 A battle of a day … got up a bit later than yesterday and set out to reach Tatvan or Bitlis, depending on how I would feel. 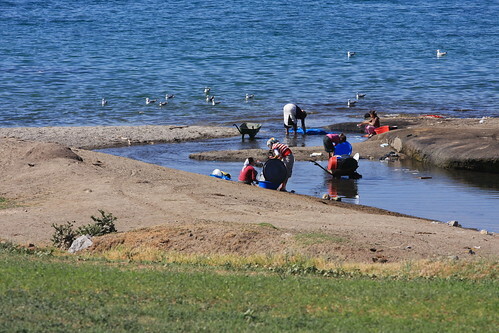 I wanted to get away from the heat of the plains I was on and to Lake Van where things were supposed to be a bit cooler. The first few km were devastating. Very steep uphill sections and a very strong headwind made for some tough going. 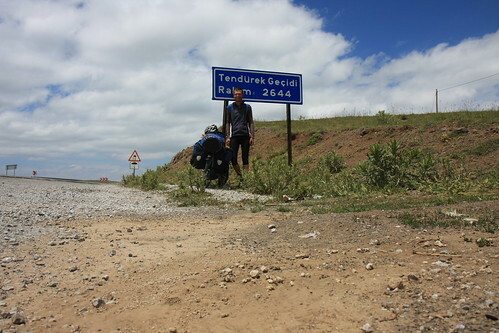 I would not really gain any altitude until the turnoff to Tatvan though as all the uphills were followed by downhills. Not much in making for a good start. Then the climb began in more serious terms. The road follows a river valley and continues to wind up for the next 50 or so km. Mostly uphill, some drops bringing you back down to the river level. I was sweating a lot, trying hard to keep hydrated. The total fluid intake for the day was more than 8 liters, including juices and Coke. The valley currently sees a lot of construction, the road is getting two more lanes, which made for some slow progress at times. Halfway up – during one of many stops – I was approached by a kid. I didn’t have the calm to be stared at for 5 or 10 or 15 minutes and tried to tell him that I wanted to be alone. This is rarely, if ever, successful. People will just walk for 5 meters and then stop and stare again. So, after trying to shoo him away, he trodded off only to come back later and show me a handwritten note: “I’m police” and asking for money. Understand that this kid was 14 years old at the most – I couldn’t help but laugh at the moment. It does show something that is prevalent here in this area though. Kids are asking a lot more for money than in any other place that I have been to and the area generally seems to be much poorer than previous ones. 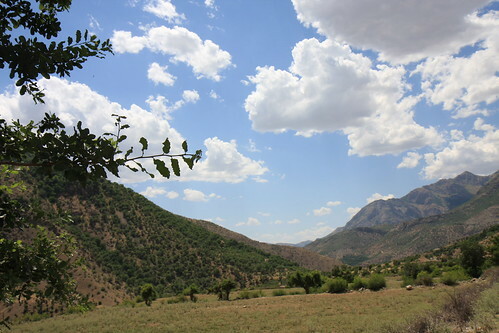 When I finally reached Bitlis, I was ready to quit for the day. 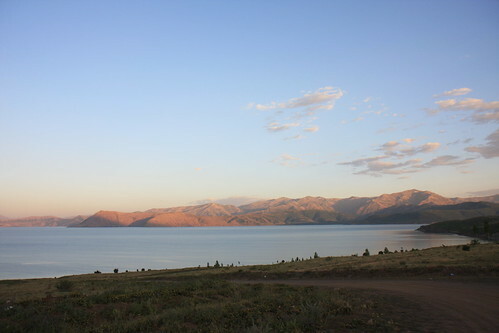 But then I looked at the map and convinced myself that the lake would be much better than what was around me. 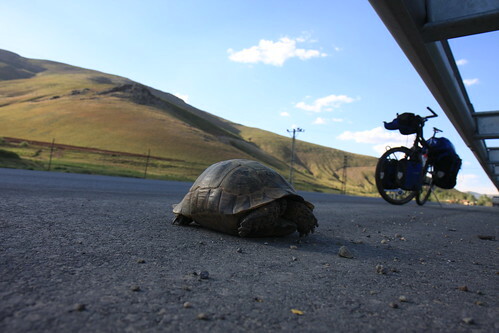 So, after rescuing this little creature from the oncoming trucks (it was hissing pretty badly when I picked it up), I got to the top where a very strong tailwind made the last 10km to Tatvan a no-brainer. I was happy because after a few long days of constant ups and downs there was a flat stretch with a tailwind, making progress simply a joy. I was cruising along at 30km/h when all of a sudden the lakeview opened up in front of me. It came out of nowhere. I was just concentrating on the few meters in front of me, looked up and saw it. Magnificent. I hadn’t made up my mind whether to take the southern route around the lake or the northern one. The decision was rather simple. I watched the flow of traffic for a bit. The northern side it would be - much less traffic from the looks of it. I was hoping to be able to pitch close to the lake, but the military had taken the beachfront property for the next 7km or so. I finally found an area only to be told that it wouldn’t be possible to pitch my tent there. After 5 minutes of discussions (things are rarely what they seem to be at first, which can be frustrating as everything is made much more complicated than necessary it seems), I was graciously given permission (I don’t think they really had any say about this) and found a good lakeside spot. By chance I happened upon 2 teachers, a lawyer and a religious scholar whom I shared dinner with before they set out to get back to Erzurum. The lake is quiet and peaceful as I am typing this, the stars clear and the moon still beyond the horizon. Great end to a long day.